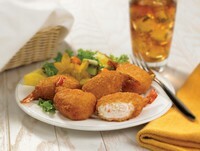 Tender, butterfly shrimp are stuffed with real cheese blends and coated with flavorful breadings for an irresistible combinationof taste and texture. Easy to prepare and impressive on the plate. Do Not Thaw * Do Not Overcook. Fry in clean oil at 350°F/177°C for 3 ½ - 4 minutes or until golden brown.